ATK has teamed up with FITECH EFI for our Complete Engine Packages with EFI (Electronic Fuel Injection). Our Complete Engine, or Stage 3 Engine, is designed for those that are wanting to drop the engine into their project and fire it up. We try to outfit the engine as completely as possible to save you time and headaches. A Ford Complete Dress engine typically consists of the Stage 2 build out plus the following: EFI, Spark Plug Wires, Spark Plugs and a Dyno Test/Tune. Engine is designed to have great street manners, and work with most stock components. 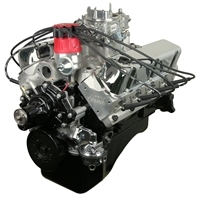 This engine produces big block torque while still producing enough vacuum for power brakes.